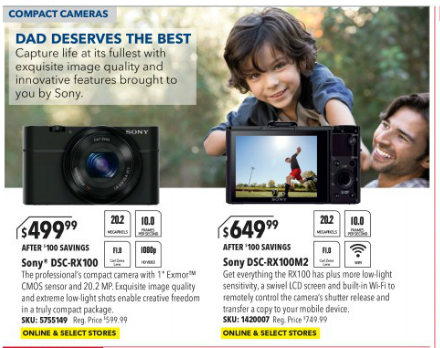 Overview: Print Ad in the weekly circular to promote Sony’s premium RX100 Point & Shoot Cameras targeting Father’s day shoppers. Channels: Best Buy national print circular. Project Role: Project lead to manage the ad mock by briefing the creative agency (2-Twelve Studio), consolidating internal feedback and providing creative direction on rounds of reviews both internally and externally with Best Buy. Results: Quarter-page ad placement dedicated to Sony featuring two premium models with lifestyle image in national weekly circular.